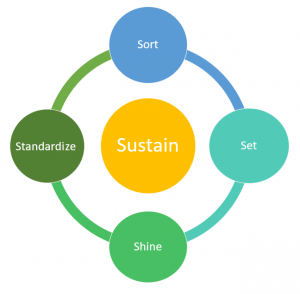 The 5S methodology aids us in reducing waste in the workplace. The 5S methodology utilizes visual controls that tell us at a glance how work should be done and whether it is deviating from the standard. At Toyota, an emphasis on reducing any waste is paramount. Visual controls are integrated into processes to assist workers to maintain an ideal working state. The visual aspect means being able to look at a process, a piece of equipment, inventory, information, or at a worker performing a job and immediately see if the standard for performing the task is being used or if there is a deviation from the standard. We can think of common visual controls that all of us use a in our everyday lives. For example, consider traffic signs. Good traffic signs do not require you to study them- you see them and the meaning is immediately clear. We teach 5S and other Lean Tools in our Intro to Lean Thinking courses.